NIA CHARLESTOWN NEVIS (February 26, 2018) — A greater number of young persons should take advantage of fully-funded scholarships offered by the Caribbean Development Bank (CDB). The call was made by Hon. 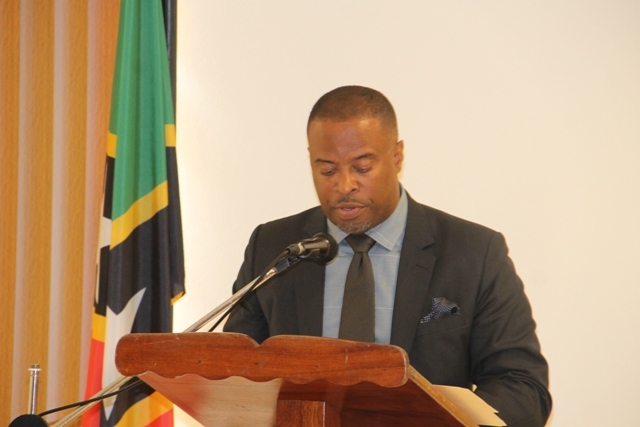 Mark Brantley, Premier of Nevis and Minister of Education, at his first monthly press conference held at the Cabinet room at Pinney’s Estate recently. He said he had been notified by a team of CDB consultants who met with his some days earlier that they had difficulty finding persons willing to take advantage of the scholarships. “A number of fully funded, those words should be music to anybody’s ears. Young people, fully-funded scholarships. That means they pay for everything for you and they are asking for people to show the necessary level of interest. “We apparently have two youngsters from Nevis who are already abroad and have taken advantage but they say that there are other scholarships that are available and they are having some difficulty. So I want to use this rostrum…to appeal to our teachers who might be interested and also to our students to apply for these scholarships,” he said. Mr. Brantley explained that the team of CDB consultants were visiting regarding the Technical and Vocational Education and Training (TVET) Enhancement Programme. In 2015 the government of St. Kitts and Nevis accessed financing from the CDB to implement the TVET Enhancement Programme. The Board of Directors of the CDB approved US$8.3 million in financing support to the government in enhancing its technical and vocational education system to improve national productivity, drive economic development and boost competitiveness. The TVET Enhancement Programme aims to improve the quality, relevance and efficiency of the TVET system, in an effort to help narrow the gap between the demand for and supply of skilled labour. Meantime, the Premier also urged persons to ready themselves to be a part of the project moving forward. He said much has been bantered about regarding the lack of skills certification but the project offers certification for those in and out of school. “I am also very happy to report that what I have been advised by the CDB consultants is that those who are no longer in school but who are described as those out there performing the skills but without certification that the TVET programme will also now allow them to be certified, he said.